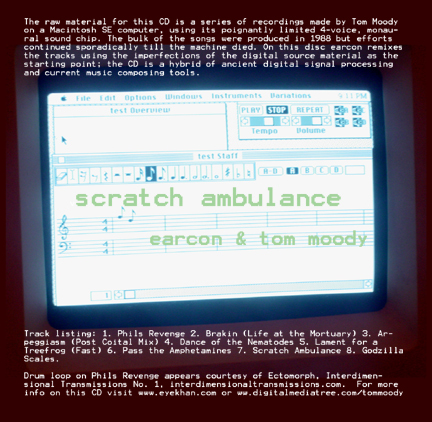 Mac SE remixes on "Reuse Aloud"
2/28/2013 3/28/2013 by tom moody Comments Off on Mac SE remixes on "Reuse Aloud"
The remixes and reinterpretations by Earcon (aka John Parker) of my Macintosh SE songs from the '80s and beyond will be featured on a UK internet radio series* during the month of March. The series is Reuse Aloud, the site is basic.fm, and here is their page about our collaborations. Other artists include DJ Danger Mouse, DJ Food, the Polish Ambassador, Diplo, and many more. *Will post an update with dates/times. Am not certain what is meant by basic.fm's statement that "on [March 1] 2013 we will take over the radio. For one month we will broadcast across the airwaves." That suggests open-air transmission but I'm not finding any call letters or AM or FM frequency for the station. I think the way it works is our music will be played at selected times on the monthly schedule of "Reuse Aloud" internet radio shows and then will be featured in a marathon performed in a gallery setting. More when I know. Mar 29-30 Broadcast Marathon - closing event for the exhibit will include GIFs and video made by John Parker and me collaboratively.